RAYMONDVILLE — Ten years ago, flat swaths of farmland stretched across most of the area’s horizon. Today, towering wind turbines are transforming the landscape, jutting from farmers’ fields from northern Cameron into Willacy County. 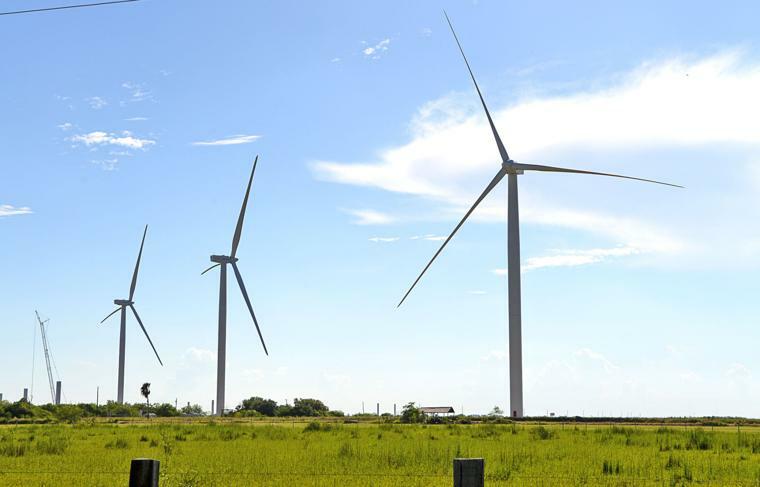 Some say it’s the wind that’s turning Willacy County into an international wind farm magnet. “It’s a great place for wind farms,” Jeff Ferguson, Apex Clean Energy’s senior vice president for development, said yesterday. The latest developer to join the party might be Apex. The Charlottesville, Va., developer is expected to meet with county commissioners Thursday to propose the development of a wind farm at the famed El Sauz Ranch. The company is proposing construction of about 100 turbines, County Judge Aurelio Guerra stated yesterday. Ferguson said the proposed wind farm would generate 300 megawatts of electricity a year. The proposal comes as commissioners consider agreements with developers of two other wind farms, Chief Appraiser Agustin Lopez said. Since 2009, wind farms have helped fuel Willacy County’s farm-based economy, pumping tens of thousands of dollars into the area’s poor school districts. Now, many farmers here are counting on turbine leases to boost their incomes. Developers say it’s a natural phenomenon based on the temperatures of land and waters in the Gulf of Mexico that drives their companies to build wind farms here. Guerra said the project, expected to begin late this year, is projected to be completed in late 2020. Willacy’s wind helped drive developer Joe Wetegrove to work with EDF Energy to plan a wind farm on the county’s southeastern edge. Now, EDF, a London-based company, is proposing about 125 turbines to generate 272 megawatts of power a year. It’s been about two years since more turbines sprang up across the county’s rural landscape. Lopez said E.ON Climate & Renewables, a German-based developer, was the last company to build wind turbines here. In December 2017, E.ON expanded its wind farm that now numbers 188 wind turbines near San Perlita, said Jeff Tulis, the company’s spokesman in Austin. In 2009, E.ON launched the county’s first wind farm with 112 turbines. Since then, the company has expanded its operations. Now, commissioners are considering revising the county’s agreements which offer tax breaks in exchange for money in lieu of taxes, Lopez said. Lopez said it like looks like more wind farms are coming.